Famous people born on DECEMBER 26 tend to be extremely active as a Capricorn. Sometimes, they do too much. They don’t like to follow rules and regulations however, they have a high level of functionality to attend to. It would seem that saying “no” is not something they are capable of. To make things happen, they have to be creative and use other sources that they wouldn’t normally. They keep their head up when it comes to finances. They are always looking for way to increase their earning potential. As an entrepreneur, famous celebrities born on December 26 know there is no such thing as too much money. They also believe in giving back. As a friend, they remain close to their long time friends and their family who could be far away. They are actually the glue that keeps it all together. On the other hand, when it comes to intimate relationships, they would rather just hang out by themselves. They have found love to be difficult to handle. 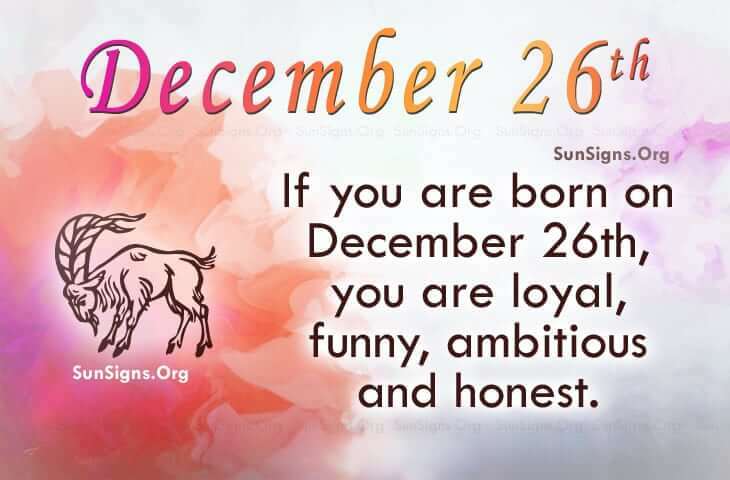 Famous people born on DECEMBER 26th are Capricorn who are loyal but rebellious. They will be going places and they have many projects on hand. If they could say “no,” they’d likely finish those they start. This can be as stressful as they find dating although others find their jokes funny.